Guitar Lessons St John’s Wood. Here at Bruce Music: Guitar Lessons London we provide Guitar, Bass, Ukulele and Piano lessons. We teach students of all ages and all ability levels, anywhere in Greater London and the surrounding areas. We’re continuing our current North West London focus, because today we’re talking about St John’s Wood, NW8. This is a very famous area of North West London due to Abbey Road studios (and zebra crossing), Lord’s Cricket Ground, Regent’s Park and some very leafy streets. 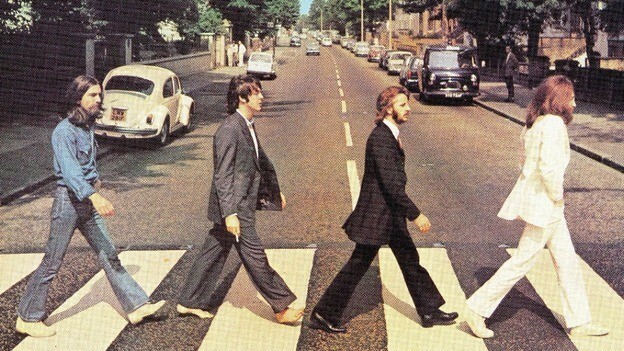 The Beatles’ Iconic Abbey Road Album Cover – The Band Crossing The Road Outside Abbey Road Studios. When you’re talking about music and St John’s Wood, there’s one big feature that dominates, and that’s Abbey Road Studios. Besides, of course, The Beatles, the studio’s world-famous facilities and award-winning engineers have hosted many huge artists, from Pink Floyd, to Adele, to Jay Z. “Live at Abbey Road” was another huge success of the last decade. It was a television programme which invited a different artist or band on each episode to perform 3 songs and be interviewed, in a rehearsal/behind-the-scenes style. Here’s The Red Hot Chili Peppers performing ‘Dani California’ (complete with ending Guitar solo) from the Stadium Arcadium album, on “Live At Abbey Road” in 2006. More famous even than the studio, maybe, is the zebra crossing outside. This is due to it being the crossing featured in The Beatles’ iconic Abbey Road album cover (above). Every day, tourists flock from all over the world to walk across it, usually posing halfway for a photograph which provides amusement and frustration for pedestrians and drivers respectively! The stretch of white wall that runs from the crossing all the way along the front of the studio building is covered with messages from tourist visitors. We even heard that as a result someone has to re-paint the wall every two weeks, but we think that might be an urban myth, as you can find graffiti a decade old if you look properly! Watch the crossing carnage for yourself – There’s even a Live Stream from the crossing – Enjoy! Our Guitar teachers are professional, experienced, and friendly. At Bruce Music our progressive Guitar teaching methods and our excellent customer service set us apart. We provide the highest quality Guitar Lessons London. To book, enquire, or discuss anything at all about your Guitar Lessons St John’s Wood – get in touch now! Guitar Lessons St John’s Wood Is A Service Provided By Bruce Music.